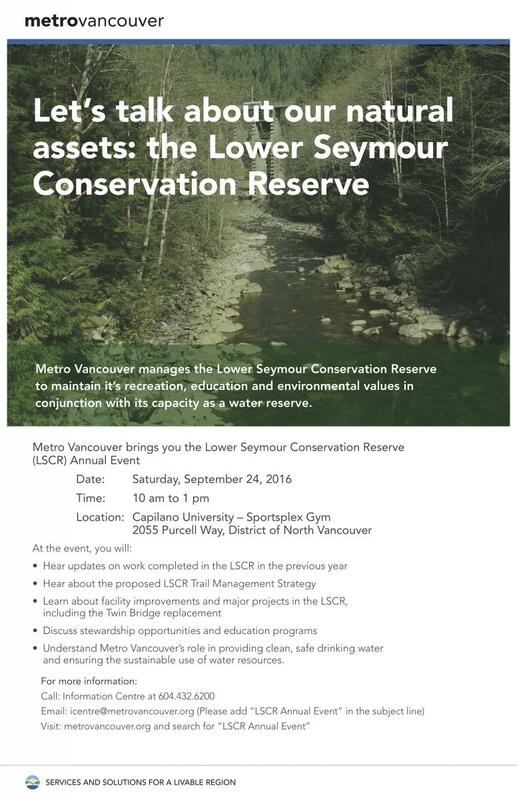 Metro is hosting a public meeting September 24th between 10:00-1:00pm at Cap U Sportsplex. It will be a drop in format with booths set up where people can get info, ask questions and do activities. The LSCR has begun their 10 Year Trails Strategic Plan with a series of random stratified trailhead survey’s that will run from July 2016 until July 2017. This process ensures representative capture of data across the spectrum of use times, days and seasons. Sampling may also consist of interviews, focus groups, windshield QR codes, and more. Look for the survey team out on the LSCR trailheads for your chance to fill one out! New washroom facility is expected to be completed by Friday April 18th in the LSCR main public parking lot. Upgrades to Bridle Trail between Fisherman’s and Hyannis are complete. Dale’s Trail will receive some annual maintenance in mid-April; work will be conducted by a contractor hired by Metro Vancouver. Expect 2 to 3 days for completion of work. 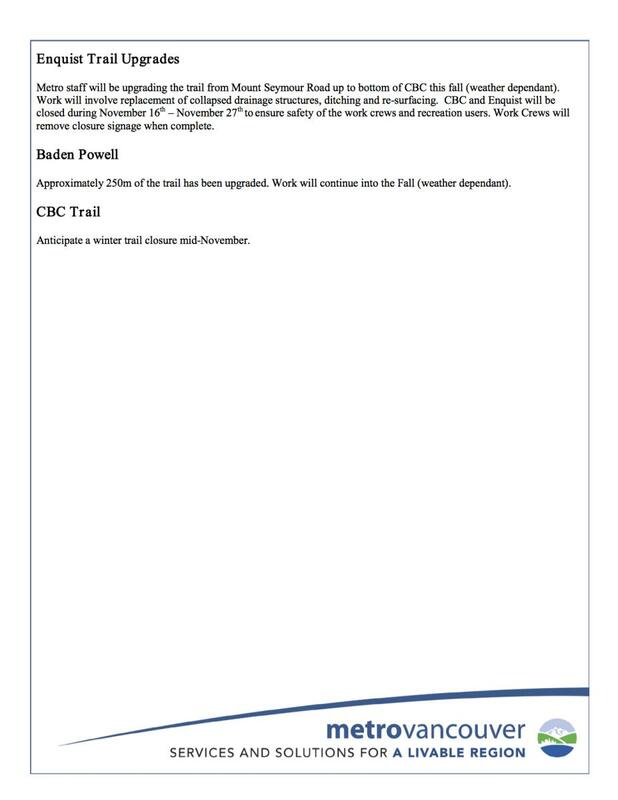 CBC Trail has undergone a safety assessment (by Metro and an external consultant); work will be done to the upper and bottom portions of the trail. There are two un-safe structures that need to be removed. A 24m section at the very top and a 12m section at the very bottom near the Enquist trail junction. The only wood that we will be replaced is across the ditch/creek at the Enquist juncture. The wood used will be taken off of old bridge on Dale’s Trail and recycled. 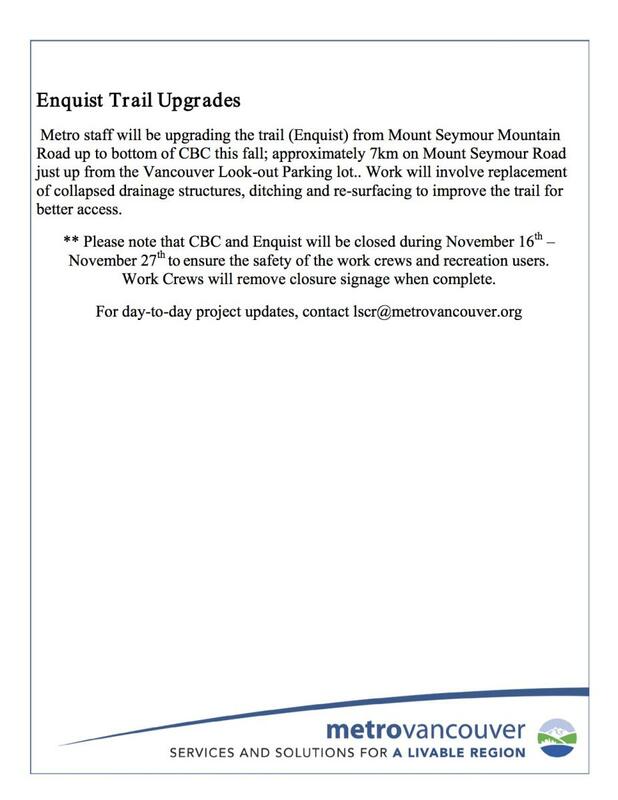 The opening of CBC will be announced when this work has been completed, please respect the trail closure. The section of Baden Powell down from Richard Juryn down to stairs is complete. Old line has been decommissioned and restoration will happen in March. Upgrades of Bridle from Hyannis down to Fisherman’s continues. Drainage and surfacing has been updated. Watch for crews and machines in this area. Expected to be completed in March. We will start Bridle Trail upgrades next week on the section between Hyannis and Fisherman’s. Hyannis users are to expect limited parking by LSCR kiosk for material and minor delays on the trail. Users should expect machines and use caution in this area. Signage has been posted to notify users and appropriate signage and cones will be places during duration of project. We suspect the project will continue into the beginning of March.